Get the latest updates on active transportation issues in West and Southwest Chicago below and make sure to join our In Your Community: West and Southwest Chicago e-newsletter list. The e-newsletter comes out quarterly and offers a quick read on issues related to bicycling, walking and transit in your neighborhood. If you are interested in learning more about any of the information provided on this page, please feel free to contact Kyle Whitehead at Kyle@activetrans.org or 312-216-0473. Four Vision Zero West Side community organizers attended 225 events and contacted 7,750 residents to collect input and share information about traffic safety. Through surveys and public meetings, they learned that West Siders want to see education events and changes to street design that enhance safe bicycling and walking, such as protected bike lanes and curb bump outs which shorten a crosswalk for a person walking. The final round of the outreach project will include round table meetings with community organization leaders, an open-streets-style community event to increase awareness, and a small-scale rapid delivery project. In order to develop a shared vision for a river trail along the South Branch of the Chicago River, Active Trans is conducting outreach to community stakeholders in Pilsen, Bridgeport, Brighton Park and McKinley Park. We’re planning several public events in the upcoming months, so stay tuned for more information. Our project partners include Metropolitan Planning Council, Friends of the Chicago River and the South Branch Park Advisory Council. In a report by Mary Wisniewski of the Chicago Tribune, clear evidence indicates that racial profiling in bike ticketing continues. The report states that “about 56 percent of all bike tickets were issued in majority black neighborhoods, compared with 24 percent in Latino neighborhoods and 18 percent in white neighborhoods, according to Chicago police statistics. Blacks, Latinos and whites each make up about a third of the city’s residents, according to the U.S. Census.” Active Trans is disappointed to see that this has not been addressed since the report came out last year. This profiling cannot continue if we are to live in an equitable city. As we said after the original report last year, Active Trans strongly condemns any use of traffic enforcement to target specific members of our communities. We call on the Chicago Police Department to respond to the disparities uncovered by the Tribune’s reporting. Active Trans staff conducted outreach to learn more about what priorities for safety communities had that are located in the High Crash Areas outlined in the Vision Zero Action Plan. We met with the following groups and others to discuss traffic safety and Vision Zero in Chicago: Austin Coming Together, Garfield Park Community Council, North Lawndale Community Coordinating Council, Teamwork Englewood, West Town Bikes, Westside Health Authority and Working Bikes. Some themes emerged across the outreach conducted: concerns about personal safety affect transportation choices, infrastructure improvements are needed most urgently, and traffic enforcement is necessary, but shouldn’t be abused. These communities also experience high economic hardship. Many of them are suffering from decades of disinvestment and population loss – much of it a result of structural racism and other forms of discrimination, which in turn impacts the types of solutions that would best serve the present reality of safety on the West Side. Separately, the city was also conducting outreach on the West Side in the month of September with a series of three public meetings close to the High Crash Areas outlined in the VZ Action Plan. At the city’s public meetings, the outreach team collected community input on traffic safety, sharing with people potential design solutions apart from enforcement. Through these public meetings and attending other community based events, the outreach team has reached over 5,000 people. Bus ridership in Chicago has been steadily declining for the past ten years, even on some of the highest ridership routes on the West Side such as the #53 Pulaski and the #66 Chicago. Active Trans recently released a report that focuses on service and policy changes that can be made to get Chicagoans back on the bus. To apply some of the principles laid out in the report, we suggested specific intersections where dedicated bus lanes, traffic signal improvements and faster boarding could be implemented to increase speed and reliability of bus service. Fewer Chicagoans riding the bus means more driving and more cars on our already congested streets. 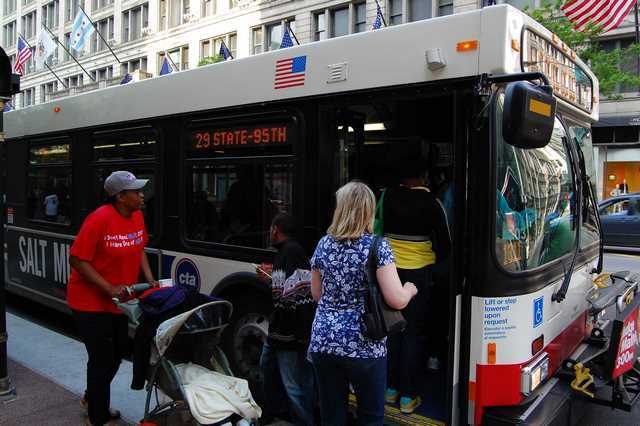 Bus service has major implications for equity as well, due to the disproportionate number of bus riders who live in low-income communities or work in places that lack access to the rail transit system. Please read and share the report on social media with #backonthebus or have your organization join the Back on the Bus Coalition! We are looking for individuals and organizations in Chicago who support a vision for a continuous river trail. You can show your support by joining the Chicago River Trail Coalition either as an individual or an organization. Learn more at www.activetrans.org/chicagorivertrail and sign up to receive the monthly newsletter highlighting campaign progress and further opportunities to get involved. The Mayor’s Office released the Vision Zero Action Plan in late June. Half of the high-crash areas identified in the plan are located on the city’s West Side, including Belmont-Cragin, Austin, Humboldt Park, West Town, West Garfield Park, East Garfield Park, North Lawndale and the Near West Side. Part of the plan is to develop community-led crash-reduction plans for each high-crash area. The city will conduct outreach at existing community meetings and additional Vision Zero events. Stay tuned for ways to get involved in the Vision Zero outreach efforts in your West Side community. The CTA is in the final stages of its Blue Line Forest Park Branch Feasibility/Vision Study, which began in 2013. Recommendations, shaped by stakeholder outreach, will include rehabbing tracks to improve slow zones, wider platforms with elevator access, and improved noise and weather protections. The start of construction is contingent on identifying funding. Costs are based on the conceptual planning study, which will be refined in the project development process and were estimated at $1.7 billion in 2016. Costs include track and related infrastructure; reconstruction of the Forest Park Yard, Shop and Terminal; upgrade of stations from UIC-Halsted to Forest Park; and building six power substations. Progress was made on the North Lawndale Neighborhood Plan at a community visioning workshop in June. The North Lawndale Master Plan is a community-based revitalization effort that is being written in collaboration between the Chicago Metropolitan Agency for Planning’s Local Technical Assistance Program and the North Lawndale Community Coordinating Council. Key areas of the plan include transit-oriented development; economic development; and development of the Ogden, Roosevelt, and 16th Street Corridors. At the workshop in June, residents reviewed existing conditions and opportunities for improvement in transportation, housing, public safety, health and wellness, and other quality-of-life areas. The final draft of the plan is being developed and will be presented to the community later this year. North Avenue is a state-owned, supersized street designed to move as many cars as quickly as possible. The Pace North Avenue Corridor Study is focused on improving public transit, pedestrian access, economic development and more along the corridor between Harlem Avenue and York Road. Pace Suburban Bus hosted an open house about its North Avenue Corridor Study in March. The agency aims to increase bus speed and reliability along North Avenue between Harlem Avenue and York Road with improved routes, signal timing and stations. The final report is now available. Is dockless bike share a good idea for Chicago? The flexible model of dockless bike share could add value in Chicagoland communities, where a more structured, docked system isn’t available yet or isn’t feasible given the land-use patterns and distance between destinations. 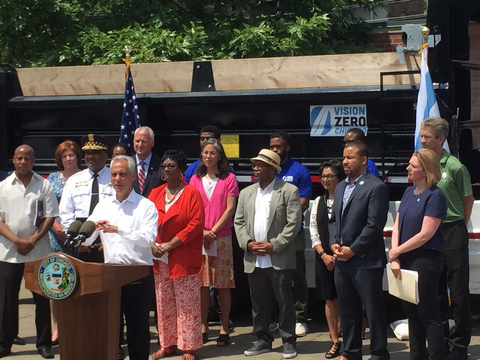 City officials must ensure any operators launching in Chicagoland are safe, high quality and committed to serving everyone in the city – particularly communities that currently lack bike share. 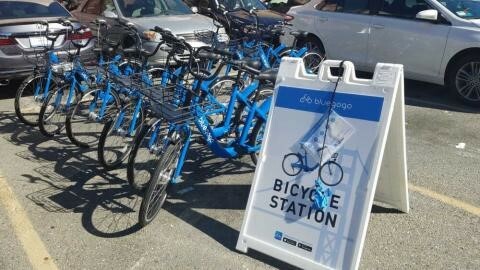 Check out a recent a blog post about this new bike-share model. On January 25-26, the Chicago Transit Authority (CTA) hosted Public Hearings on the Blue Line Forest Park Vision Study. The project will include much needed track infrastructure repairs, station upgrades and improved accessibility for people who bike and walk. CTA is working to secure the necessary funds to keep the project progressing to the construction phase. Through this process, residents and transit-riders will have additional opportunities to provide feedback on improvements the CTA Blue Line Forest Park Brach. Please share your thoughts and ideas with CTA at BlueWestStudy@transitchicago.com or call 1-888-YOUR-CTA. The North Lawndale community is developing a new community master plan. Active Trans has been participating in meetings related to developing recommendations for improvements to the local transportation infrastructure. The planning process is slated to wrap up in Fall 2017. Learn more and see how to get involved on the project website. Congested on Chicago? Perturbed at traffic on Pulaski? Bus ridership has been declining significantly over the last several years, and we believe the central problem is unreliable and slow service. Thus, many people are choosing alternative options when it comes to getting around the city. Our new campaign, Speeding Up Chicago’s Buses, seeks to change this downturn by promoting near-term, low-cost bus service improvements to the city’s highest ridership routes — such as faster boarding practices, dedicated bus lanes, and traffic signal improvements. Please take our survey and share your opinion on improving Chicago’s bus service! On March 7, Active Trans hosted a West Side Leadership Network meeting. The meeting brought together advocates from across the West Side to discuss local biking, walking, and public transit issues. Topics included bikeways improvements, Vision Zero, and Divvy bikeshare. If you’re interested in being a part of the Leadership Network, please contact Cynthia Hudson at Cynthia@activetrans.org. Active Trans is pleased to announce a mini-grant opportunity to support community based events during Chicago Bike Week (June 16-23, 2017). This funding opportunity will award 3-6 grants of $500-$1,000 dollars each. Applicants are encouraged to be creative and there are no limitations on the types of events that may be supported. Got an idea for a community bike ride, an educational workshop, a bike repair demo or other bike-related activities. For more details, including information on how to apply, please contact Cynthia Hudson at Cynthia@activetrans.org or 312-216-0464. For several years, Active Trans has been working with the Chicago Department of Transportation (CDOT) and Alta Planning + Design on the Go Campaign to encourage biking, walking and transit among residents in individual Chicago neighborhoods. This year Go Garfield Park was actively encouraging residents in East and West Garfield Park to walk, bike and use public transit more often. The program hired local ambassadors to work with more than 20 community organizations, including the Garfield Park Community Council, Marillac House and Breakthrough Ministries. They hosted group bike rides and walks and distributed transportation resource kits to over 1,000 residents. CDOT created a video featuring our Go Garfield Park ambassadors during one of their group bike rides. 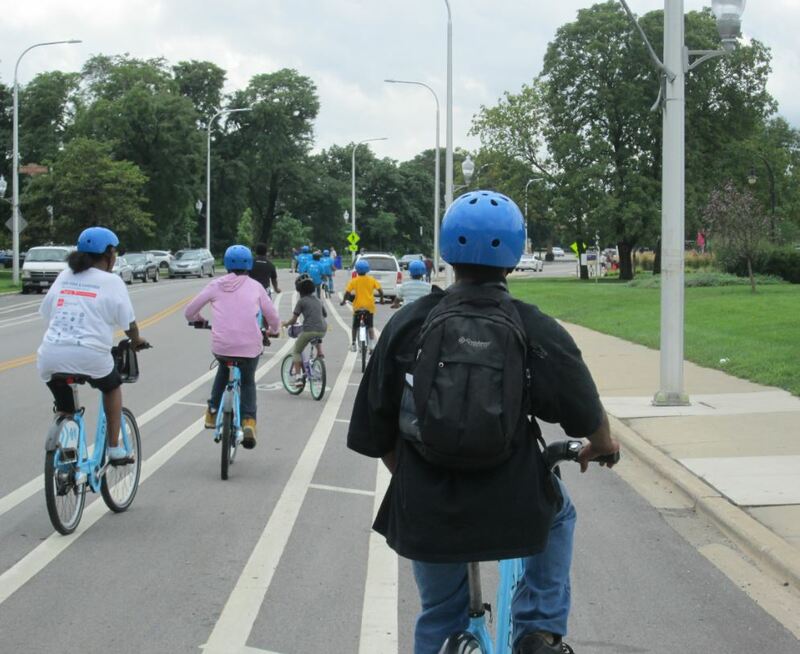 Other popular events this summer included Divvy For Everyone Bike Rides with Slow Roll Chicago, West Side Wellness Walks, a Garfield Park Treasure Hunt and Bicycle Rodeo Safety Courses. Learn more at the Go Garfield Park Facebook page. The transition to Ventra has made it more difficult for many low-income residents to ride transit to job training, housing, medical appointments, childcare and other critical destinations. A recent Chicago Jobs Council (CJC) report, “The Hidden Cost of Ventra,” highlights the key issues and recommends specific changes that would remove unnecessary hurdles for providers and boost ridership and revenue for the transit agencies. The report details the challenges providers face in ordering transit passes in bulk for their program participants. Active Trans supports the policy recommendations in the report and is working with CJC and social service providers to advocate for the changes to be implemented. Read our blog to learn more about this issue. After a period of public outreach, the Mayor’s Bicycle Advisory Committee announced a plan to add three new bikeways on the West Side in 2017 and 2018. These new bicycle facilities will include stretches of street space on Chicago Avenue from Austin Boulevard to Laramie Avenue, Polk Street from Independence Boulevard to California Avenue, and Kedzie Avenue from Polk Street to Franklin Boulevard. We’re excited to see the city making this important investment in making biking safe and stress-free on the West Side, and hope to see more in the future! Check out the Chicago Department of Transportation’s Complete Streets website to learn more about the city’s comprehensive bike plan. In late June, hundreds of children lined up in front of North Lawndale College Prep for their chance at getting a free bike at the Cycles for Peace event. 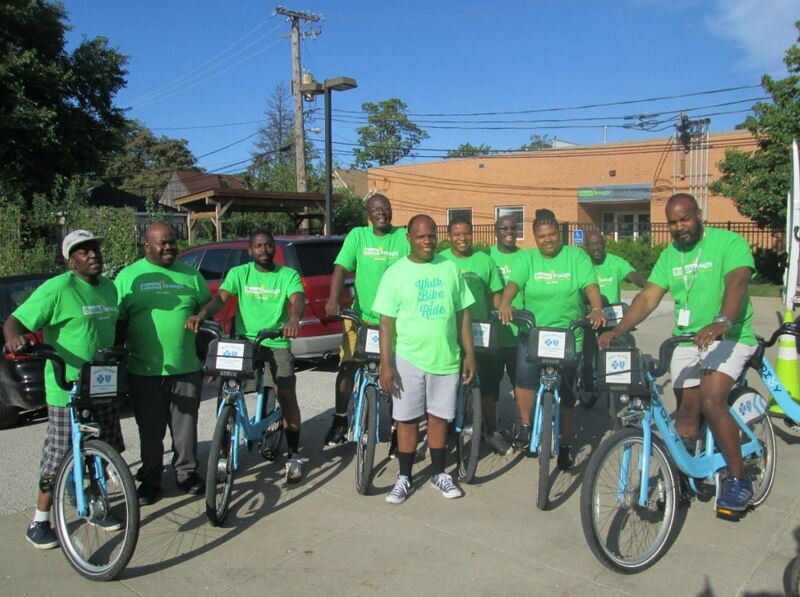 Lack of access to bikes for children in North Lawndale was what spurred the TAG Foundation’s Angela Ford to organize the event, with the help of Working Bikes and other community organizations. Attendees got their bikes and helmets fitted, took a bike safety class, and tested their skills on a safety course before riding their new bikes home. Ford’s vision to make a social impact on the neighborhood and improve the community is at the heart of this moving event. Read more on our blog. Our Safe Crossings campaign raises awareness of pedestrian safety issues and advocates for improvements that would benefit all users at some of the most dangerous intersections in the region. Thanks to this work, Madison Street and Chicago Avenue are seeing major improvements to safety through the installation of pedestrian refuge islands. Both Chicago/Cicero and Madison/Cicero appear on our Safe Crossings list of 10 of Chicago’s most dangerous intersections. The addition of refuge islands will help with traffic calming to slow vehicles as they approach the high-crash intersections in the corridor and in turn, will greatly improve safety for all users. Thank Ald. Ervin and Ald. Mitts for making our streets safer. Email them at jason.ervin@cityofchicago.org and emitts@cityofchicago.org. Please email suggestions for additional local community resources to Jim@activetrans.org.